Former President Chandrika Kumarathunga, Chairperson of the Office for National Unity and Reconciliation, convened a forum for Constitutional Reforms Deliberations on September 13. The participants were parliamentarians, professionals, academicians and civil society activists, about 140 in number. All distinguished invitees and the forum hosting members, including the chairperson, were punctual in presence and hence the speech-making and the discussion-conduction could begin with no disappointing delay. In short, an organisational success it was. It had been discernibly aimed to seek different views of the varying members of different communities, on ways forward, for ensuring that the constitutional reform process and its outcomes would reverberate in the minds of the general public, in order to produce a sustainable, long-lasting and positive constitutional impact in the country. Yet, it was a pity that the forum had been constrained to a little more than three hours. Hence, the participant’s sincere efforts, to be total and well expressed had to be managed with the available time frame and therefore, the proposals couldn’t be hermeneutically substantiated. Now, unsubstantiated suggestions are prone to misapprehension, misinterpretation and misinformation. Virtually in most well developed countries, having advanced economies and strong human rights structures, the politicians are not elected from among uneducated thugs, drug barons, those convicted by the courts as criminals and thieves, who robbed public funds, particularly from among those who have successfully failed even GCE O-Level. Unfortunately Sri Lanka is absolutely opposite of this. Any rogue or thug has the total possibility of being elected to the supreme body of the governance and become an MP, minister, Prime Minister or even the President. Now nobody wants to change this existing catastrophic status quo. Many politicians are in the said category. They want their uneducated family members to capture the governing positions in the days to come. They bring all sorts of arguments to counter this view. Uneducated man can handle the educated. It is not education, but experience what is needed. To be intelligent, the education is not a must. Politics and education are unconnected subjects. There are countries governed by uneducated politicians. And many more. It is well known in some countries, how uneducated presidents abused political powers to kill the educated MPs and ministers on the fear that the educated ones may capture their position. A commercially operative business by an uneducated man cannot be compared with the serious administrative business of the governance. The people, with their suffrage, execute the franchise to elect their governing administrators. Their powers to govern are derived from the people as a whole. The governing competence is not a power tool, descended down from the ancestral heredity. Nor is it an inheritance of the majesty of any dynasty. Hence, in any governance, the final supremeness is ascribed to people. Nevertheless, the question arises: Is the Parliament, consisting of people-elected members, supreme? The much anticipated natural answer should be yes. It should be supreme. Yet, the practice of some Afro-Asian parliamentarians have already created an indubitable space. The beautiful dignity of Parliamentary supremeness is deposited in danger. In some Asian countries, there are parliamentarians who have obtained no minimum marks to pass even GCE O-Level. The essence of the jeopardy is rooted in power abuse, defection for self-gains, corruption, plunder of the people’s wealth, nepotism, treasury management by the family, under invoicing and/or over invoicing of multi-billion projects, impairment of the rule of law, politicisation of the judiciary, attack on the media freedom and many more. 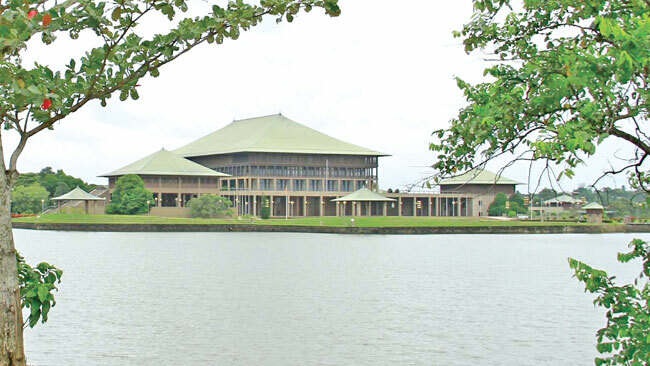 Hence it is very much timely that in the constitution making of Sri Lanka, the competent Constitutional Steering Committee took into its serious account, the flaming content of the above said properties of the impurity of contaminated politics. One reliable way to quash the contamination is to constitutionalise a minimum set of educational qualifications, which would legally qualify a political electoral aspirant to be nominated as a candidate for the legislature. Let us guard the supremeness of the Parliament via producing intelligent, intellectually developed, sense of shame to commit wrong having fear of blame to be engaged in corruption possessing individuals for the Parliament, with an intensity of integrity and with no records of criminality. All laws are formulated, debated, approved, ratified and incorporated into the normative system of the country by the members of the Legislative Body, elected by the people as a whole. In the Charter of the United Nations, the peoples of the world have affirmed their determination to establish conditions under which justice can be maintained to achieve international cooperation in promoting and encouraging respect for human rights and fundamental freedoms without any discrimination. The Universal Declaration of Human Rights enshrines the principles of equality before the law, of the presumption of innocence and of the right to a fair and public hearing by a competent, independent and impartial tribunal established by law. The international covenants on economic, social and cultural rights and on civil and political rights both guarantee the exercise of those rights, and in addition, the covenant on civil and political rights further guarantees the right to be tried without undue delay. Yet, frequently there still exists a gap between the vision underlying those principles and the actual situation. Hence, the organisation and administration of justice in every country should be inspired by those principles, and efforts should be undertaken to translate them fully into reality. This requires rules, concerning the exercise of judicial office, to aim at enabling judges to act in accordance with those principles, stemmed from the socio-legal attributes of independence, impartiality and equality of all before the law. Why? Since, the judges are charged with the ultimate decision over life, freedoms, rights, duties and property of citizens. Now, there are two resplendent institutions. One is the lawmaking legislative body, comprising elected politicians. The second is the judiciary engaged in the administration of justice via the aggregate of norms enacted by the Parliament. Members of the judiciary must be educationally qualified. No judge can be appointed without proper prescribed educational eligibilities. This is an indisputable, inevitable Catholic practice, recognised and accepted universally. The explosion of contradiction between the two establishments is a natural ineluctability. One comprises a team of erudition and educational qualifications. The other constitutes a community blend, with educational qualifications, less education and/or no education, having delegated powers to pass laws. The judiciary has no competence to make law. It can interpret law and make use of law in the administration of justice. Here between the qualities of two communities the contradiction arises. If a country would consist of an uneducated Parliamentarian majority (the writer is emphatic that he, herein, has no reference to the composition of the present parliament), the laws, enacted by them, would dominate the very soul of the judiciary, disallowing its members to move beyond the space, provided by law. For example, if some arbitrary parliamentarian psychologies would constitute a law, perching the Head of the State above the operative law, the judiciary becomes helpless, even if the Head of the State would murder people during the daylight. What to do? He is above the law. Now, the dignity of the judiciary is in danger. There may be counterarguments on this account. In spite of such polemics, there is intelligence, wisdom, reason, common sense and experientially existential practice. The majority of such components have affirmed and re-affirmed only one fact. An educated community is much better than an uneducated group to constitute a parliament. Such composition would mitigate the tension between the two important institutions and strengthen the power of the rule of law, the equality of all before the law, impairing the interference into and the politicisation of the judiciary. If this proposal is breached and discarded as an illogical and foolish statement, the most devastating question soon to arise is: If the legislative body can comprise uneducated individuals or drug barons, then why should the District Court, Appellate Court and Supreme Court consist of educated and erudite legal luminaries? A couple of uneducated people of experience and maturity and/or some drug barons, not yet convicted by law, would be a perfect choice-option to be appointed as District Court, Appellate Court and Supreme Court judges. Hence, the present writer proposes to introduce a constitutional entrenchment, embedded in the constitution to be a set of precise educational qualifications for each and every politician, to be elected to the legislative body, in consonance with hierarchy of the rank of governance.